Managing taxpayer dollars better – I firmly believe that we can’t get lasting results without fundamental change. That means cutting waste, modernizing systems and making state government more productive. In November, we completed the first bond sale of our administration — $750 million issued at 2.6 percent — one of the lowest interest rates in the history of the state. We’ve restructured our payments for the pension fund to make better use of your tax dollars. We’ll save more than $1 billion over the next 20 years. Modernizing the tax system for roll-out in 2016 — This was an area where government has failed in the past, but our restart is now on track. We have added staffing to answer questions from the public and tax preparers and found $21.5 million in tax fraud. Changing the way we handle information technology and improving services – This means cancelling procurement of systems we can’t afford, terminating contracts and seeking recovery of funds when consultants fail to perform. It also means using less paper and improving public access to information and services. Managing our prisons better — We reduced overtime by 16 percent, saving $1.4 million. More importantly, we have not cancelled family visitations due to staff shortages at any facility since last January. Expanding the safety net — We just received a check for $660,422 for our improved work on a public assistance program and earned federal recognition for being among the top six in the nation for timely applications. We’re also helping spearhead juvenile justice reform and creating an integrated, long-term care program for the state’s Medicaid beneficiaries. Supporting agriculture statewide — We’re working to double local food production in the future and acquire land for smaller, diversified agriculture. 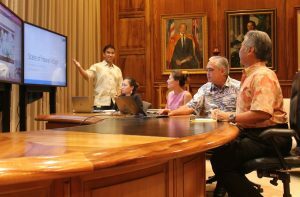 We’ve also formed a fact-finding group on Kaua‘i to examine possible health and environmental effects of pesticide use in genetically modified crops. 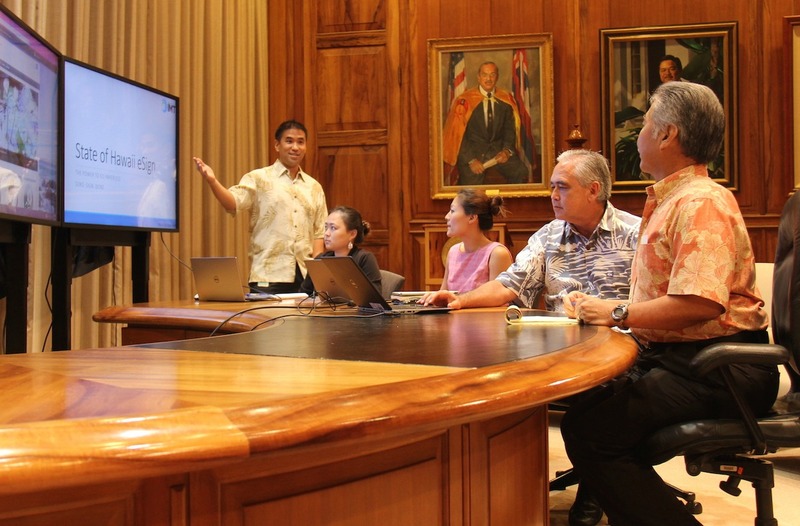 Top image: CIO Todd Nacapuy demonstrates eSign Services for the governor and his team.